Here you get the link for TutorialsPoint offline version download 2018 for free (latest full website). TutorialsPoint is getting more than 30 million visits per month and it is the most popular programming language tutorial website on the internet. 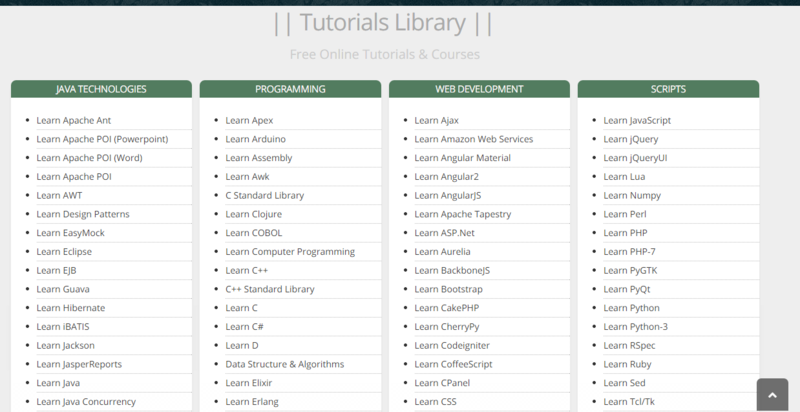 The tutorials are very helpful for beginners to learn any programming language. It also provides thousands of examples and facility to edit and execute them online in their own online IDE for many languages. The biggest drawback of TutorialsPoint is that you can’t access these awesome tutorials without internet. Fortunately, I have found a great solution to this problem. So in this article, I am sharing the link to download TutorialsPoint offline version for absolutely free. Above link will directly download the file. Just extract it using any software like WinZip / WinRAR. This will open tutorialspoint offline version into your default web browser. Please comment if you face any problem. This has been updated to 2018 version, check now. as its really great stuff to share. some are not opening for example most of the academic part. Change the browser and try, as all of them are working. I think it is some how the older version. Many of the spring technology tutorials are not included here!!! some tutorials are not opening properly ..
Link is not proceeding in downloading status. It’s not getting downloaded after 15% to 20%. Please help me. I downloaded the zip folder . It was saved to documents folder. I extracted the folder and double clicked on Index.html file. Web browser opens with · tutorialspoint link. when I click nothing happens. It’s in the step 1. Could you include vb.net as well?